So, a couple of months ago, my local club had a model sale, where you could take your unwanted models along and see if any other club members were interested in buying them. One member brought along his old tank army, featuring 3 super heavies and 8 LRBT's. 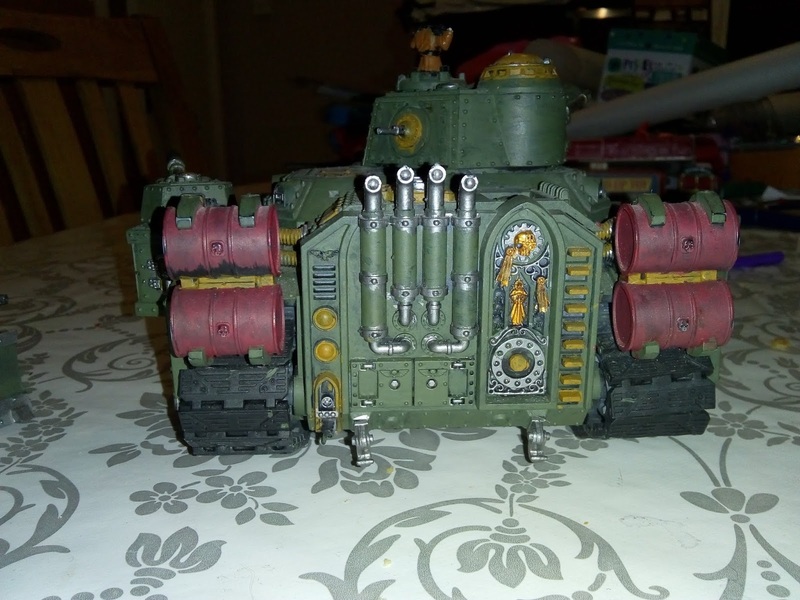 In have always wanted a super heavy for my collection, my first choice being a Stormlord, with its twin Vulcan megabolters. So when I turned up to the sale to see three super heavies sitting on the side, I got quite excited. One was out of the running straight off, as it was a Shadow sword. Now, don't get me wrong, shadow swords are great at taking down big things, such as knights and other super heavies but when you not facing them, they aren't much use. 3 strength 16 Ap-5 2d6 damage shots are a bit overkill for taking out marines, even primaris ones. The other two super heavies there were a Hellhammer and Stormlord. Given the choice and what I said earlier, you'd be forgiven for thinking I'd go straight for the Stormlord, however, the Stormlord had seen better days. It was missing several bit, which I could have scrounged of eBay but I couldn't be bothered, so I went for the Hellhammer. I also picked up another LRBT, meaning I now have 4 for a complete tank "platoon". The two "new" tanks, little and large. So, here she is. She needs some work, mostly just a few touch ups and a little bit of repainting here and there. They are tabletop ready as they are, which is useful but I will still adjust them a little to better fit the rest of the tanks. The main issue with the current painting is the brown highlights, which I will turn to green or, in some case, silver. The commander also needs finishing off. The yellow of the lights shows up really well in the pictures here but in reality they are very faint and need re-doing. 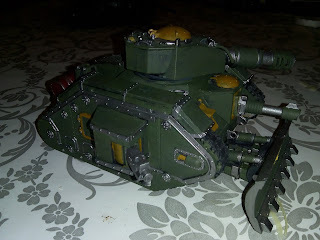 Also the first bit of damage, the missing lascannon turret. 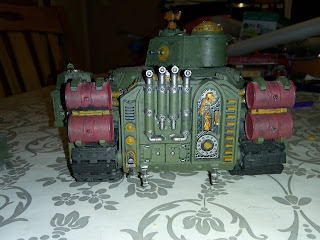 You can also see that the heavy bolters are not fitted to the sponsons very well and I may need to split the sponsons to re-doing the bolters housings. So touch ups required at the back and the barrels definitely need another coat of paint on them. Second minor damage, a couple of track links missing, these should be easy enough to replace, either with bits from underneath or with green stuff. The LRBT, again needing a minor repaint and touch ups. As with the bigger one, the extra fuel tank needs another coat of paint. 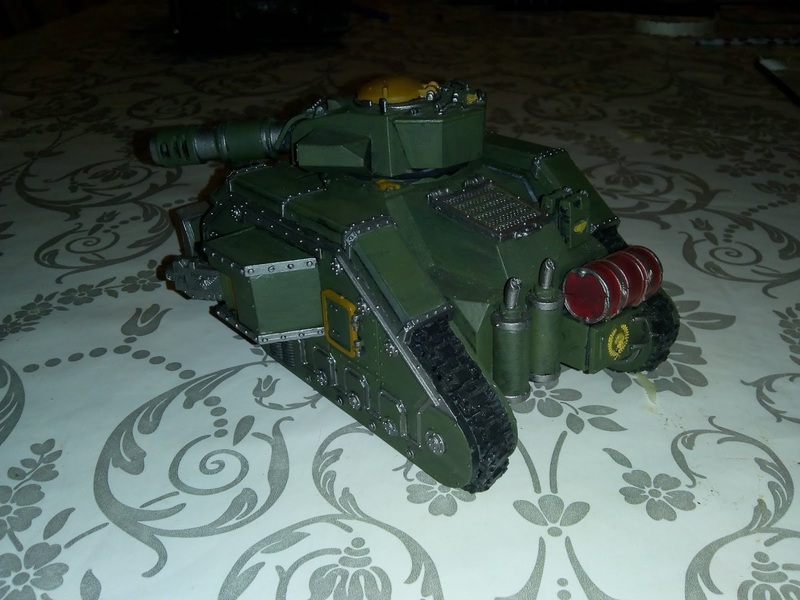 While the Hellhammer would not be my first choice of super heavy tank, it is a solid choice. With 2d6 shots at S10, -4ap and doing 3 damage per wound, you are able to put some hurt on most things. Ok, it's a little overkill on troops, but not as bad as the shadowsword. Your looking at 7 to 8 shots, hitting about 3 to 4 and doing almost as many wounds in most cases (as you'll be wounding on 2's most of the time and 3's otherwise). With 3 damage each, that's around 9 to 12 damage a time and that's not including the rest of the weapons, including that critical lasgun out the back! As for deployment, I will usually run the Hellhammer with the 4 Russ's, as an armoured fist group. 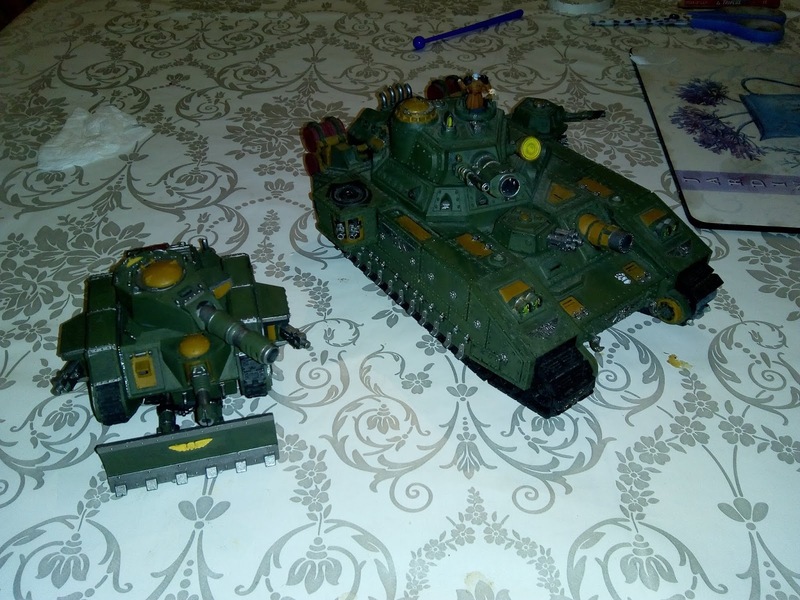 2 of the Russ's are old school ones, with fixed weapons (battle cannon, lascannon hull and bolter sponsons), the other two are new versions, one normal and one demolisher variant. 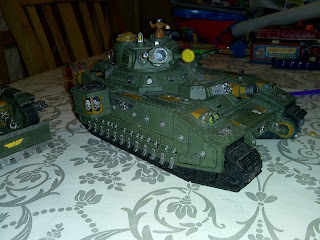 I plan on running the as two standard Russ's, one as either a punisher bolter boat (punisher plus 3 heavy bolters) or executioner with plasma sponsons, depending upon the enemy and a vanquisher tank commander with lascannon and bolter sponsons. 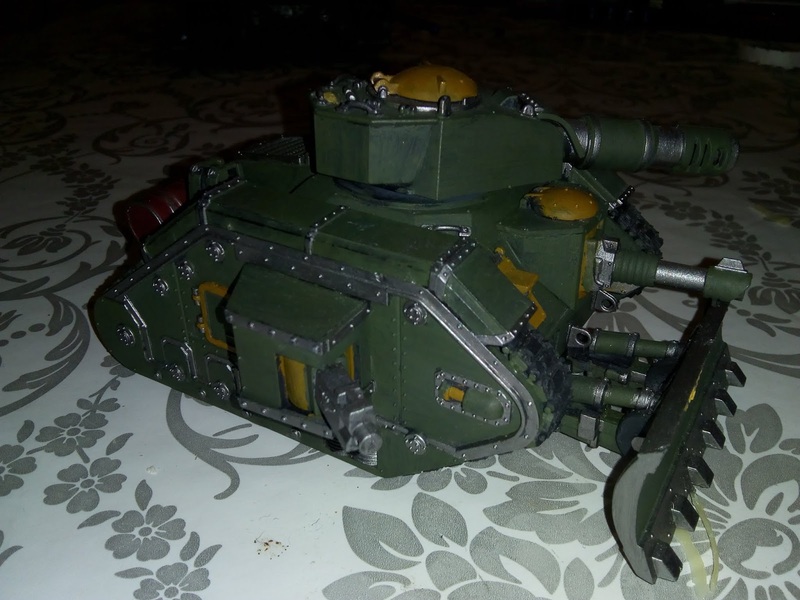 The battle tanks will flank and provide general protection, the punisher\executioner will go on point and the vanquisher tank commander will hover at the back to give out orders where necessary. The choice of punisher or executioner will depend upon the enemy. For light armoured enemies, such as eldar, guard and tau, the punisher will be better, as it is there to take out the troops and with the battle tanks dealing with the higher save units. If I'm facing power armour, either chaos or imperial, or other high save armies, then the executioner will be first choice. The inclusion of a vanquisher will also puzzle some people, as many will suggest that a regular battle tank will yeild better results, which is generally true against most targets but against single large targets, the ability to roll two d6 dice and pick the highest for damage is key. Doing this twice is even better and being on the tank commander your on a 3+bs, so more chance of hitting on the first place. The whole lot will, usually, be supported by an armoured infantry column, with a couple of vet squads in chimeras and a hellhound, with 3 sentinels pushing forward to screen any deep striking units. 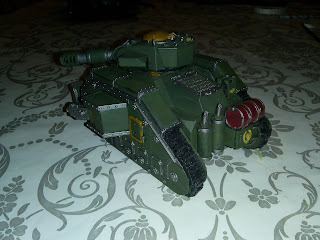 This will produce a mobile force with a central mobile castle, with mobile infantry for grabbing objectives and forward screen and all for 2000 points. Pretty cool! Armoured Guard forces always look awesome. I really like the whole idea of armoured lists and it goes well with my main infantry list, which is pretty much the polar opposite. The stormblade is awesome, who doesn't love the idea of a massive plasma gun! 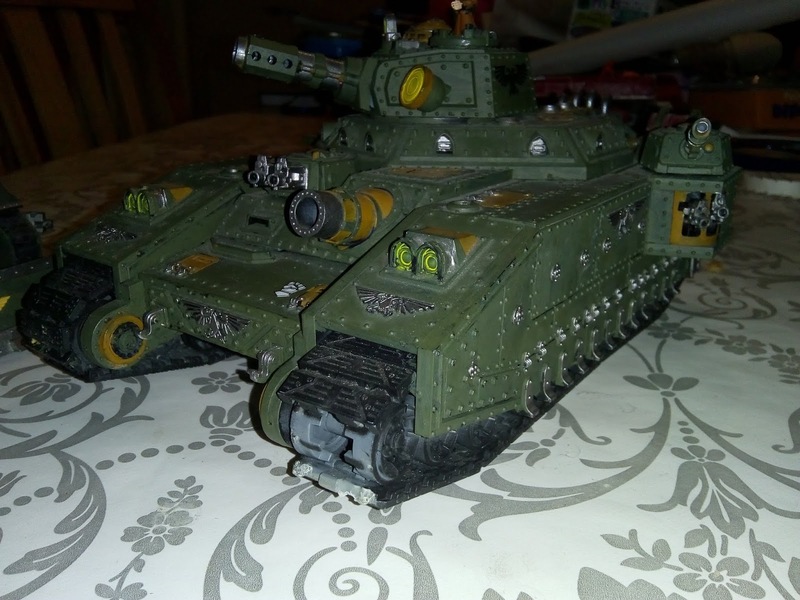 The one I really want though is the Leman Russ Annihilator, with its twin lascannon turret. Fit it with a hull laschulllascannon and a couple of multimelta sponsons and you've a real tank killer. 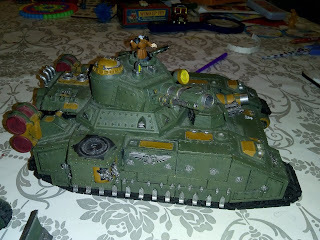 Yeah, I wish they'd added in the Annihilator when they re-did the Leman Russ kit. Always liked that variant.